The recording of images of extremely small moving objects or processes requires both ultra-high frame rates and high magnification. Slowmo has a special zoom lens to cover this type of application. When used with the Photron SAX2 high speed camera, extreme close-ups at ultra-high frame rates are possible. A field of view (FOV) of ~1.4mm is attainable with the Navitar lens from a practical working distance of 86mm. This working distance allows the flexible positioning of external light, focussed pass the lens and onto the subject matter. The Nikon mount adapter allows for the full sensor (1024 x 1024 pixels) to be used. At this high magnification, for displacement/resonance calculations, each pixel relates to 0.0013mm. With this same setup you can zoom out to a FOV of ~17.5mm. The images below demonstrate the amount of magnification possible. All were taken with the Photron SAX2 mono camera with a frame rate of 20,000fps (higher frame rates are possible) at 1024 x 672 pixel resolution. Subjects were lit with a Simpact Icarus light (other light sources can be used, please enquire). It is necessary to adjust the gain in all the images in order to increase the level of exposure. As with any type of macro filming, the depth of focus is very narrow. The field of view (FOV) at minimum zoom is ~17.5mm. Zoom the lens in to its maximum point, the FOV becomes ~1.4mm. The black lines you see in the image on the right show the 1mm divisions on the metal rule. This image shows a 0.7mm hypodermic needle at minimum and maximum zoom. The types of applications that require this amount of magnification and frame rate recording are likely to be very specialised e.g. the movement of micro particles, inkjets, high frequency vibrations. The Navitar 12x zoom lens and Photron SAX2 mono camera together provide a workable system for filming macro subjects. This combination has already been used to study jets of adhesive and the movement of particles suspended in a fluid. The lens is free to hire subject to a standard weekly dry hire rental of any the Slowmo range of Photron cameras. 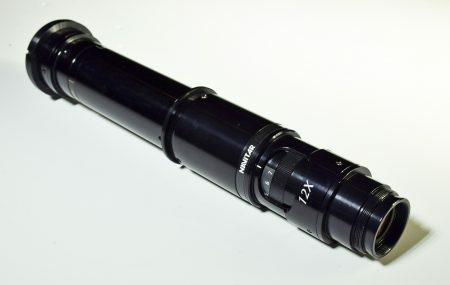 Images showing the Photron SAX2 mono high speed camera with Navitar zoom lens in operation.